PipeLine Restart Loop는 송유관의 blocking을 완화하는 데 사용하는 침적억제제의 개발이나 시험에 사용되는 새로운 기기로써, 다양한 pipeline restart test를 수행하는데 적합하다. 또한 Yield Stress 시험이 가능하며, 펄스가 전혀 발생하지 않고 교체가능한 test pipeline을 이용함으로써 pipeline blocking simulation시 매우 효과적이다. 매우 현실적인 전단력과 flow regime이 가능하다. Deposition of complex and heavy organic compounds in crude and heavy oil can cause a number of severe problems up to pipeline blocking. 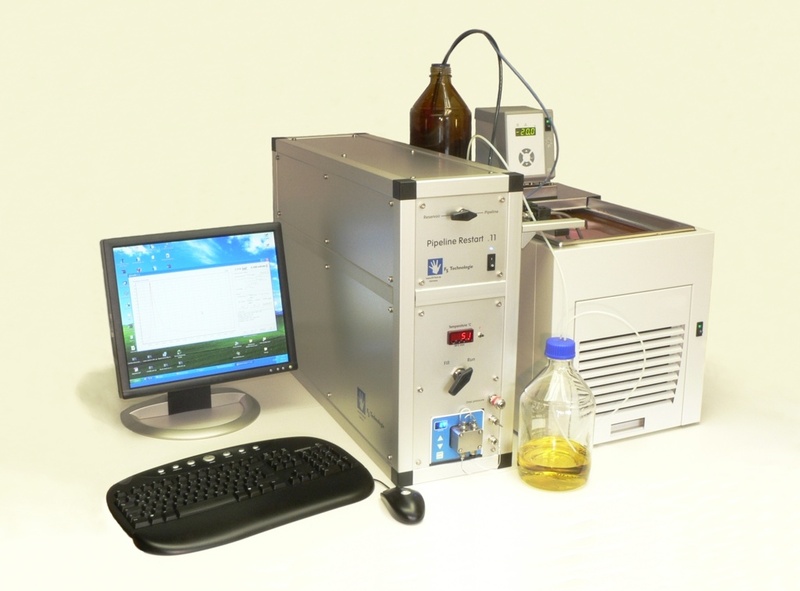 This new instrument provides the ability to develop and test inhibiting chemicals. 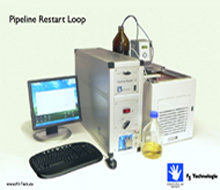 The exchangeable test pipeline is filled with the sample and cooled down to a set temperature. The cooling rate is programmable (temperature profiles). After cooling, the pump starts to press the sample through the pipeline at very low flow rates. The increasing pressure is measured at high sample rates. The pressure/time curve shows the yield break at its maximum. Measurements with untreated samples can be compared to measurements with treated samples to show the chemical's effectiveness. The especially designed high-accurate pump system provides an absolutely pulsation-free flow, with maximum pressure starting at zero flow rate. So, very realistic shear and flow regimes inside the test pipeline are possible. The exchangeable test pipelines can have a length up to 20 m at OD 1/4", even onger at smaller diameters.